It seems like Play ‘n’ Go are looking to end 2018 with their highest variance slot to date, having given it a 10/10 volatility rating in their pre-release information for Battle Royal. 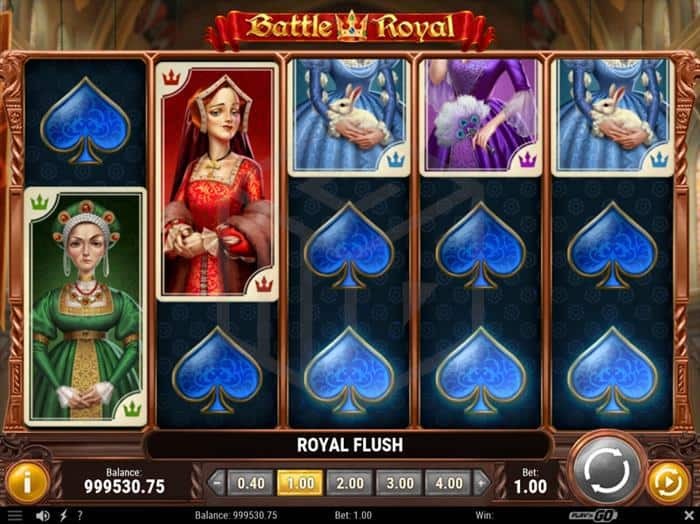 A December 2018 release with a House of Tudor theme, ‘Battle Royal’ pitches the legendary English Monarch King Henry VIII against his six wives in a fun take on one of the most infamous periods in British aristocratic history. The backdrop to the game board is set within a royal castle, with high arched ceilings, long and imposing corridors, and the royal red lion flags hanging from the ceiling either side of the game board. At other stages in the game, the game board might be flanked by dusky images of the outside of the castle, and one of the features takes you down into the castle’s dungeon with its big padlocked doorway, stone floors, and even manacles chained to the walls. All the background graphics and animations are both spot visually and historically accurate. As to the board itself, the low value symbols are the card suits; clubs, diamonds, hearts, and spades while the more valuable symbols are depicted by Henry’s 6 wives. As there are no names attached to the wives we can’t say which is which but in ascending order of value we’ll call them; blue, purple, green, red, orange, and gold – with the highest worth 30x bet size for 5 on a pay line. The wild in the base game is Henry VIII himself and the scatter symbol is of the Battle Royal Coat of Arms. Both the wives and Henry III symbols can cover the entire reel if they land fully in view. Royal Flush is a randomly triggered base game feature whereupon after any random spin all the low value symbols (card suits) will flash simultaneously and transform into an identical low value symbol which will always result in a win of some sort. 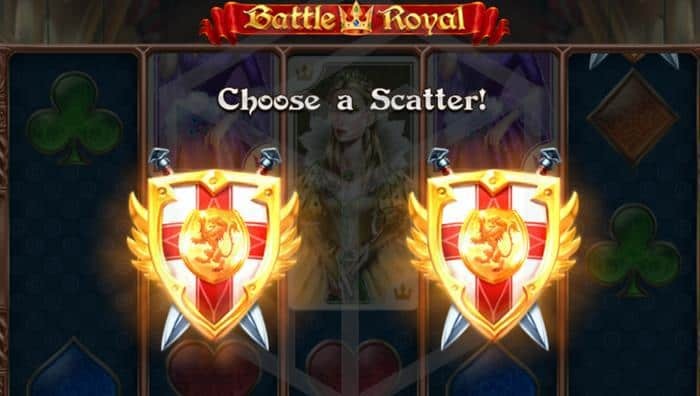 If you land the Battle Royal scatter symbol on reels 1 and 5 then you will be presented with a choice of two scatter symbols to pick from. One reveals free spins, and the other reveals the pick feature Long Live the King. We’ll start with the free spins. Prior to the spins starting you will be shown a line-up of all Henry’s wives, each with a monetary value attached to them and you must pick which of the 6 wives will survive the free spin round the longest. Once that’s done the free spins will begin, and the first thing you’ll notice is that a guillotine blade has been added to the top of each reel. With each spin, one of the guillotines will drop, and if any Queen’s head is in view on that reel then she will be beheaded and turn into a head-carrying ghost. 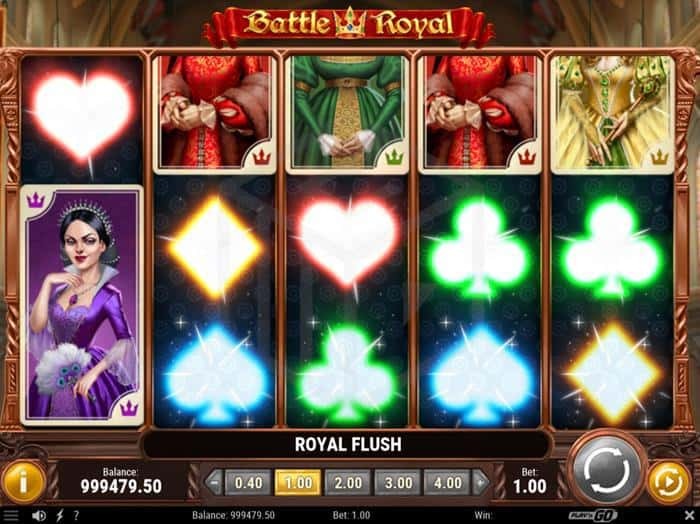 That Queen will also become wild for the remainder of the free spins and her value increased to equal the highest value symbol. 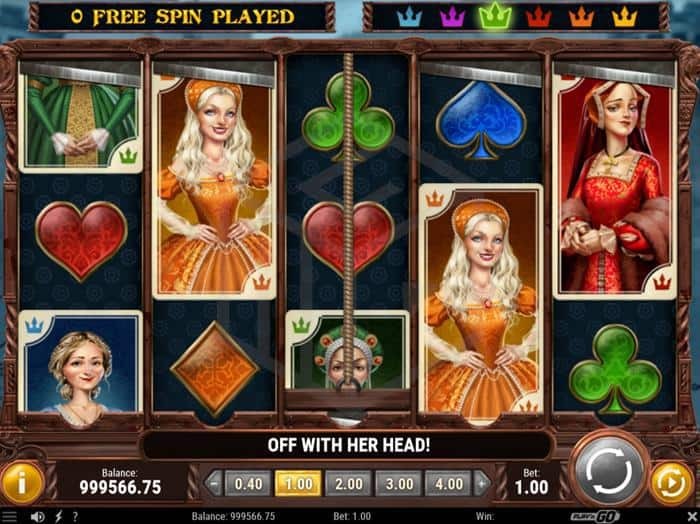 There is no set number of free spins but they continue until 5 of the 6 wives have been beheaded. As just described above, you can reach this feature by correctly predicting the beheading of Henry’s final wife after free spins, but as it is also one of the two picks at the start of the scatter bonuses it is very possible to trigger this bonus straight away. Henry is down in the castle dungeon where his wives had spent their final hours and your job is to help him plunder their loot, which is kept in the 6 surrounding treasure chests, without being set upon by the ghostly spectres of his late wives which whizz by overhead. You must pick the boxes one at a time, hoping to extract the treasure without getting in the way of any ghosts. If you get in the way of a ghost at any point the round ends and you’re awarded whatever you have won so far. 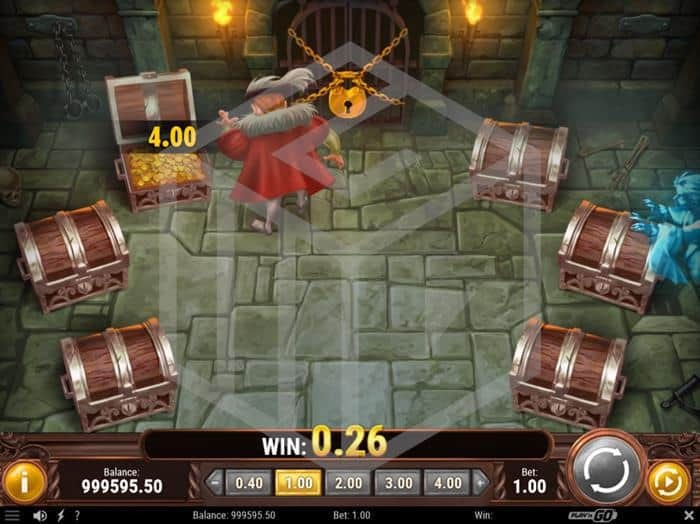 If, during your plundering exploits you find a key among the treasure then you can choose to leave the round and a multiplier will be added to your total winnings. If you so desire you can continue to loot and plunder in the hope that you don’t run into a ghost. If you have come from the free spin round it is advisable to leave as soon as you get the key as both your treasure and free spin winnings will be multiplied. If, however, you only have your treasure winnings to worry about then you ought to continue plundering until you have successfully opened at least 4 treasure chests before leaving (if you’ve uncovered a key by this point of course). Battle Royal has a lot to offer as far as a fun romp through British medieval aristocratic history goes! It takes a well-known theme and successfully turns it into a decent slot with some great features. The design is neat and there is enough going on in general to counter to inevitable periods of dead spins you’ll have to sit through while playing a volatile slot. That said, although Play ‘n’ Go have given it a 10/10 volatility rating, it never seemed nearly as volatile as say, a Merkur slot, for example so whether true high volatility fans will take to it is still up in the air. As someone who sits on the fence a little and prefers a medium/high volatility slot, Battle Royal seemed more in that wheelhouse which is possibly why I enjoyed it as much as I did. The free spin round can be superb if you manage to get a few spins in with all those expanded wilds in play, and if you manage to both correctly guess the last Queen to fall AND also unearth a multiplier key in the subsequent ‘Long Live the King’ feature then you can end up with a very big win indeed! Another corker from Play ‘n Go.